I thought it was the best book when I was a kid…and I still love it! 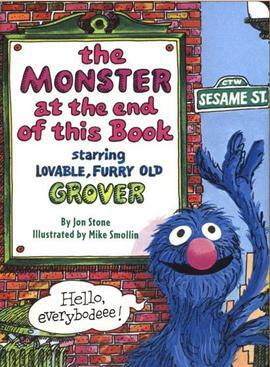 Grover keeps telling the reader not to turn the pages because, as the title says, there’s a monster at the end and he’s not that thrilled to meet this monster. But, every time the reader turns the page, he asks us why we would do such a thing since every page just brings us and him closer to this scary monster. But, we, the reader, giggle at how cute Grover is and keep turning the pages. So, yesterday, I wrote a blog post about how I was going to keep my cool (ha!) and not buy any new patterns until I was done with my WIPs- yeah, we all say that…we all write blog posts about it…but ooh! shiny! happens and we can’t help ourselves! I got an email from Style Arc about the new patterns and the free pattern of the month! This month you get to choose between two patterns as your freebie and I couldn’t resist the Tamara Knit top. Click on the image to go to the Style Arc site. I said I wouldn’t buy any new patterns…but I did! And it reminded me of the Monster at the end of the book! The only way I can see that this isn’t a bad thing..or that it’s going against what I JUST told myself not to do is that the patterns are coming from Australia and they’ll take about 2 weeks to arrive so I have time (theoretically) to finish the stuff I’ve started. When do I do a Full Bust Adjustment? good rationalisation. you’ll have to get sewing to get them done in time for your new patterns to arrive! or y’know like fabric shopping or something. I *loved* that book. And I understand the feeling. I’m pretty good on not buying fabric after a big binge but patterns … I cannot help myself. It’s just the best book ever! I still giggle when I read it to my kids. 🙂 I just bought some knits…and now patterns…hehe. I guess next is fabric for the patterns I just bought. doh! Two weeks will give you ample time to bend these purchases into the self-imposed pattern buying stipulation. 😀 Those pants are REALLY cute. I can see how you were swayed by their charm. I was really holding out for the new freebie and I’m so glad I waited. 🙂 I actually have a pair of store bought pants like the ski pants. Can’t wait to have more of that look! my kiddos love that book! and i really like all the patterns you have coming… you know all this crowd does is enable more pattern/fabric shopping… right? we never judge! I can’t talk. Most people have a fabric stash. I have a HUGE pattern stash (and a teeny tiny fabric stash). I am loving the stylarc I see on Beajay and Lara from Thornberry- my 1st was a bad choice, but I will be working them hard this summer! Never tried a stylearc…but lots of sewing friends LOVE them! I love those Lily Ski pants.